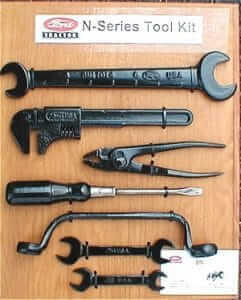 Re: Automobile branded wrenches info? Five different manufacturers made bicycles branded "Rambler" between 1888 and 1908. Maybe bicycle wrenches? I would like to find websites that have photos and details of the tools that came in tool kits, for autos, trucks, tractors, motorcycles, etc. I saw these pliers at an estate sale yesterday and paid the $2.00 asking price. Probably the closest I’ll come to owning a Lexus. Pretty well made pliers though. Every WW2 Jeep came with a fairly extensive toolset. Here is mine. Thanks for the photos Don. A number of those kit tools are very ordinary looking. How many have slipped thru our hands because we don't know the details of what to look for? Here is an early Ford marked auto wrench made by Moore Drop Forge. Probably for an early Ford toolset. Moore Drop Forge is better known for the Craftsman =v= tools that they made over the years. They also made the wartime 12” auto wrench in my Jeep toolset above.